From the world of Cars soars Planes: Fire & Rescue, a new comedy-adventure featuring a quirky crew of elite firefighting aircraft devoted to protecting historic Piston Peak National Park from raging wildfire. When world famous air racer Dusty learns that his engine is damaged and he may never race again, he must shift gears and is launched into the world of wildfire air attack. Dusty joins forces with veteran fire and rescue helicopter Blade Ranger and his courageous air attack team, including spirited super scooper Lil’ Dipper, heavy-lift helicopter Windlifter, ex-military transport Cabbie and a lively bunch of brave all-terrain vehicles known as The Smokejumpers. Together, the fearless team battles a massive wildfire, and Dusty learns what it takes to become a true hero. 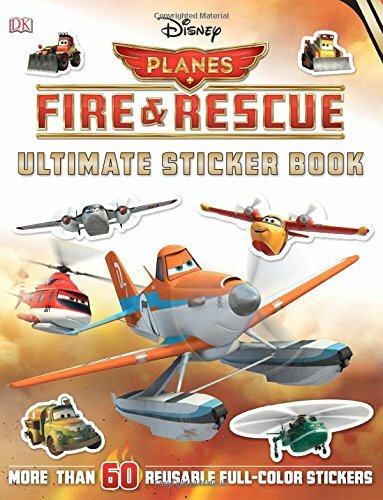 Featuring more than 60 fun and reusable stickers from above the world of Cars, Disney’s Planes: Fire & Rescue will keep kids entertained for hours. 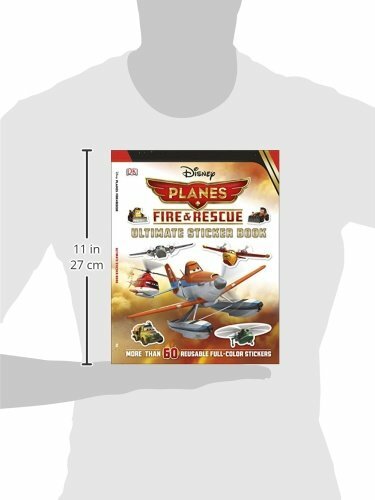 Whether it’s re-creating scenes from the movie or learning fun facts and information about their favorite Planes characters, Ultimate Sticker Book: Planes: Fire & Rescue will make children’s imaginations soar!